Once you have an amazing product and a great website, all you need is customers. Easy, right? If you build it, they will come? No, not quite. In order to be successful online, you must first understand how your competition is making money. Then, you have to figure out how you can do it better. There are at least five categories of online marketing that need to be addressed. Search Engine Optimization is a phrase that describes everything we do to get your site noticed by the major search engines. There are many steps involved, but SEO starts on your website with optimized copy and meta descriptions and an organized site structure. Then, it's all about building authority. SEO is an ongoing process, but a successful campaign will put you on the first page of the organic search results for your chosen keywords – and keep you there. QuickWit has tried and true methods of gaining exposure for your brand that will result in better search engine positions and free traffic for your site. 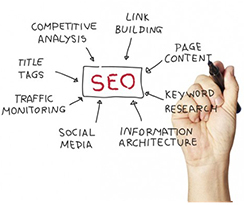 Search Engine Marketing is sometimes referred to Pay-Per-Click (PPC) marketing. With the right ad campaign, you can expect targeted traffic from visitors who are ready to convert. With the wrong campaign, well, you won't have to worry about that with us. QuickWit has experience implementing successful SEM campaigns for companies in all kinds of industries. Let's face it; with the fast paced life we live, we're all a little burnt out. Sometimes, we don't want to read. Sometimes we just want someone to tell us, through demonstration, what we need to know. Sometimes we want to be entertained. Sometimes, we just want to watch a video. QuickWit can help by creating just the video you need for your audience. It might be informational, funny, viral or straight up marketing. Whatever you need, QuickWit can deliver. Once you grab the attention of your visitors, your well-designed website will coax them into sharing their email addresses, so they can hear from you more often. This is an amazing opportunity – if don't abuse it. Many companies forget that their customers are looking for value and not just a sales pitch, so they alienate their audience and lose their shot. Don't let this be you. Let us create an email campaign that is directly targeted to your audience with their needs (and yours) in mind. Social Media Marketing (SMM) is a growing field. It used to be that just teenagers were on the social networking sits, but not any longer. Now these sites are just bursting with potential customers who are ready and willing to hear what you have to say. Again, it's important that you gain their trust, and keep it, before you go in for the sell. Don't trust your social media marketing campaign to just anyone. Trust someone who has experience with selling on social media. Trust QuickWit.